A recent study by the NYU Department of Pediatrics provides important new evidence to support intervention programs like Reach Out and Read-Alabama. • Parents who received both a book and guidance about the importance of reading through Reach Out and Read were more likely to engage in literacy activities with their children through book sharing at home. This relation was not observed in families who only received a book. • A synergistic impact of additional messaging from different platforms was demonstrated – specifically Reach Out and Read and public library programs. Over the last nine years, Reach Out and Read-Alabama practices and clinics have participated in a state-wide program, Rx for Summer Reading. This summer for our 10th anniversary, we are happy to be partnering with the Alabama Bicentennial Committee to share the book, Alabama: My Home Sweet Home to over 2,500 children and their families through this program. In addition to fun events and activities at participating practices and clinics, children will receive a prescription to participate in the Summer Reading Program at their local library. Visit the Bicentennial Partnership page for more information. This study reinforces the established evidence base showing that Reach Out and Read along with the same message from community partners like local library partners increases parent engagement in important literacy activities. Parents and friends of the children at the Primrose School of Meadowbrook used the month of February to “show the love” to the Reach Out and Read-Alabama program site at Western Health Center in Midfield. With the help of a two-year $60,000 grant from the Daniel Foundation, Reach Out and Read-Alabama providers will have the tools they need to help parents “de-mystify” the long-held belief that math is a hard subject for most children. In Alabama, over 31 percent of children under the age of five live in poverty. According to Zero to Three, a substantial portion of young children living in poverty are not getting the inputs they need to thrive, such as nutrition, shelter, and unhurried interactions and other enriching experiences with their parents or other adults. Poverty literally gets under the skin, undermining strong brain development as well as other physiological systems. The same research that finds brain differences in low- income children also finds a key protective ingredient: the parental-child relationship, which can buffer young children from the consequences of adverse experiences. 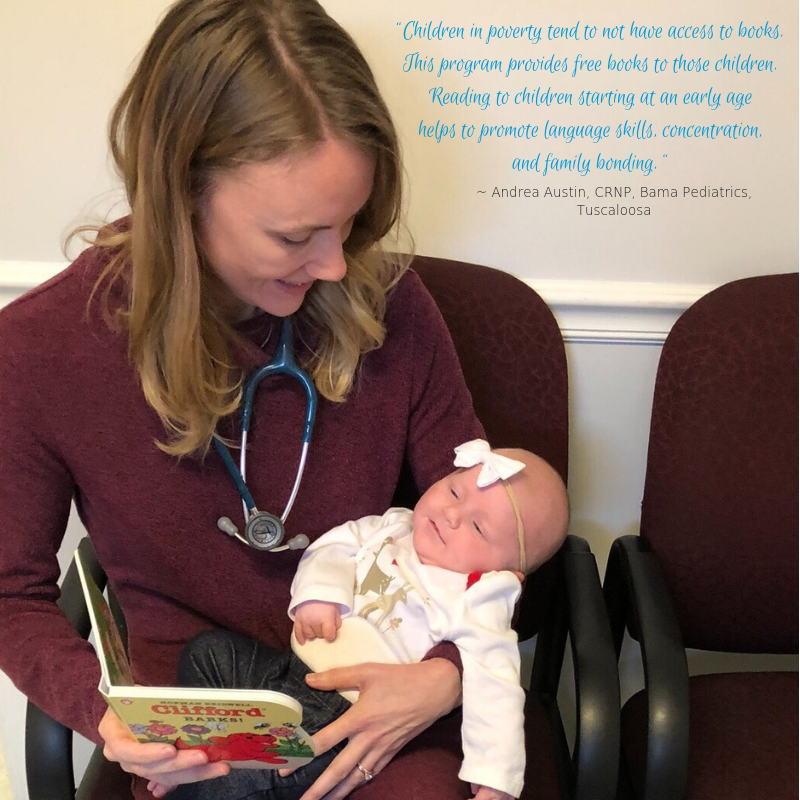 Reach Out and Read-Alabama reaches children and families like those served by Andrea and Bama Pediatrics, helping parents to structure a positive interaction with their child each day that will help that child build strong language skills. As our children spend the first four to five years of their lives in front of a device (and not a book), thousands of hours in front of a screen has various adverse effects on a rapidly developing brain. There are numerous evidence-based studies correlating excessive screen time to trouble sleeping, attention deficits, learning troubles, aggressive behaviors, delays in language. Thanks to a grant from the Alabama Department of Rehab Services/Early Intervention, 20 Reach Out and Read-Alabama program sites received copies of Count to 10 With a Mouse by Margaret Wise Brown to use as they introduce “Math Talk” to their patients at the 18-24 month visit. Meet Demarcus, a three-year-old boy who presented to Jaime McKinney, MD, FAAP, at UAB Primary Care Clinic in Birmingham. After evaluation and talking with his mother, Dr. McKinney determined that this little boy had only a four-word vocabulary, not because of autism, but because there was zero word exposure in his home environment due to the educational limitations of his parents. Preparing a child to start to pre-K or kindergarten can be overwhelming. By reading aloud every day, Alabama’s parents build a foundation for success in school through enhancing brain and language development. With your support, Reach Out and Read-Alabama will incorporate books into well-child visits and empower parents to take an active role in this important process in their child’s development. Lizz Ford, a single mother, was one of those parents. Five program sites in Tuscaloosa county will continue building better brains with the most recent support from Nick's Kids' Foundation. Born and raised in Mountain Brook, author, Allen Johnson, Jr. is well known by children and their parents growing up around Birmingham in the 90’s for his well-loved book series, Picker McClikker. In an article in the Huffington Post, Johnson says, “I lived a life filled with adventure, travel and success, but my life peaked at nine.” In his book, Fun, a memoir and books of poems and essays, he often reflects on the unfettered joy of growing up under the “benign neglect” of his parents. Drawing on his childhood memories, Johnson has written a series of three books, collectively known as the Blackwater Novels, which are reminiscent of Mark Twains’ works about boyhood in the 1930’s. While these books are targeted at fourth and fifth graders, they provide opportunities for parents and grandparents to share their childhood adventures with their children and grandchildren when read together. 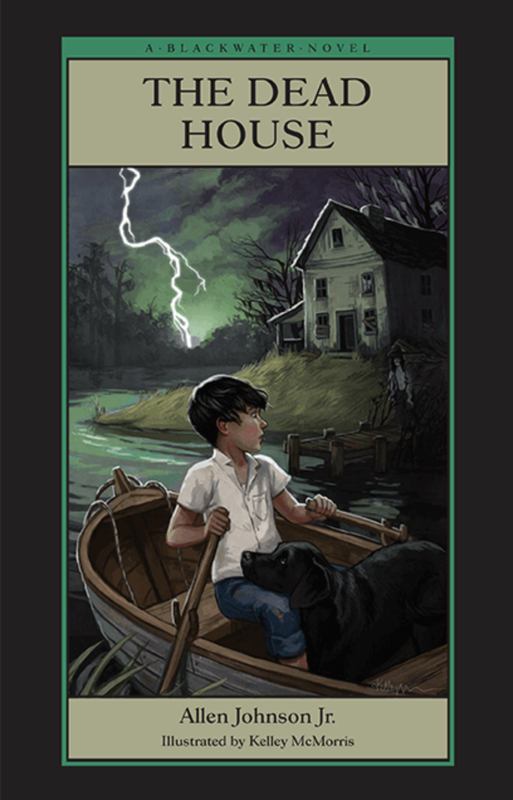 Through a partnership with Reach Out and Read-Alabama, Johnson has graciously donated 100 of the Moonbeam Award-Winning second book in the Blackwater Novel series, The Dead House. We are grateful for the donation and look forward to distributing Allen Johnson, Jr.'s book throughout the state this summer to program sites participating in our Rx for Summer Reading Campaign. While the program focuses on children from birth through five years of age, it is always beneficial to have an inventory of books to share with older siblings. We agree Dr. Meyers! 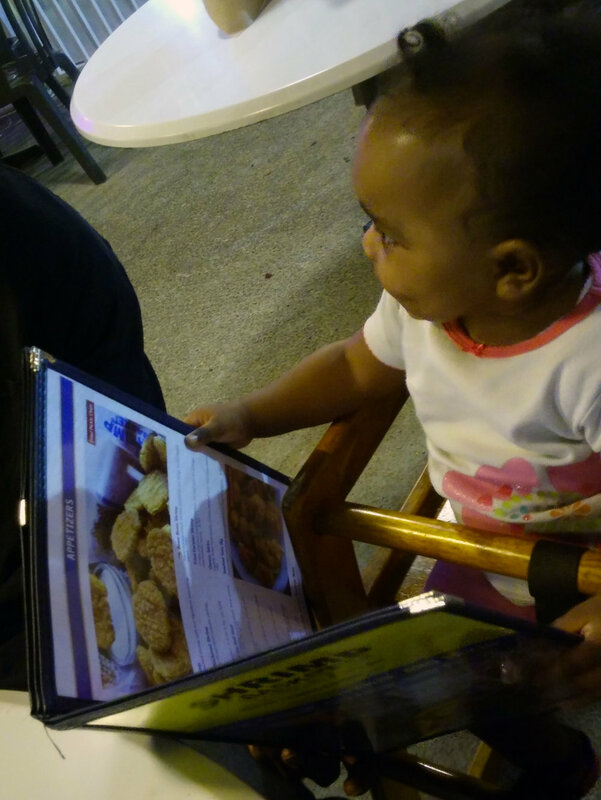 According to Reach Out and Read’s Milestones of Early Literacy Development, children from 12-24 months should point and look at pictures, hold and walk with the book and turn the pages. Sheila is building Lisa’s brain by naming each item as she points to the pictures when they are at the restaurant. Because Sheila has been reading to Lisa daily with the books that have been prescribed by Dr. Meyers, she has learned how to use everyday moments to continue that process of learning and language development with her daughter. "Instead of just an admonishment to read the books, the Reach Out and Read program uses them as a bridge to connect parents and children," said Dr. Dipesh Navasaria, Medical Director of Reach Out and Read-Wisconsin, in a recent article in the Herald-Tribune. Navasaria stresses that programs aimed at babies and young children should really be honing in on parents as the lever that affects a child’s success most. Elizabeth Dawson, MD, FAAP and Area 5 Representative for the Alabama Chapter-AAP is the medical consultant for Reach Out and Read-Alabama at Charles Henderson Child Health Center in Troy. A program site since 2001, five providers prescribe 1,400 brand-new books to the children and families that they serve each year. On March 6, Gadsden Pediatric Clinic kicked off their Reach Out and Read-Alabama program with a “Seuss-tastic” celebration, joining other children and families across the nation for the 20th year of Read Across America. We had a great 2017 and it was donors like you who made it possible! We had a great 2017 and it was donors like you who made it possible! Our year at Reach Out and Read-Alabama touched the lives of so many. Together we provided 150,000 new books to children at their well-child visits and 214,000 opportunities to educate parents to build better brains and brighter futures. When a trusted physician or other medical provider offers guidance about reading aloud to infants, toddlers and preschoolers, and provides a book to read, parents have an opportunity to give their children the best start in life. Over the last couple of months, two programs sites, Gadsden Pediatric Clinic and Gary Eberly, P.C. in Foley, were approved to begin their Reach Out and Read-Alabama programs. Gadsden Pediatrics will be prescribing books to over 2,500 children annually with the help of eight medical providers. In addition to prescribing books and instruction to parents, families will have an opportunity to receive more books by registering for the Dolly Parton Imagination Library (DPIL) through United Way. "Once parents understand the impact that reading daily has on brain and language development through Reach Out and Read, books from DPIL is an added bonus." Welcome to our new program site in Gadsden, Gadsden Pediatric Clinic, P.A.! Listen as Drs. Claire Yother and Cynthia Hill talk about the impact of the program in their practice. We are grateful for the partnership with United Way of Etowah County & Help Me Grow Alabama! With the addition of this practice, four pediatric practices in Baldwin County now particpate in Reach Out and Read. Like in Etowah County, the United Way of Baldwin County partners with Reach Out and Read-Alabama to provide books to each of these practices. Supportive parenting prevents the reduced growth of certain areas of the brain that occurs as a response to living in poverty. This new research shows that positive parenting can overcome the effects of poverty on healthy brain development in adolescents.